This installment features Columbia University President Lee Bollinger and the Foundation for Individual Rights in Education’s Will Creeley. This episode features an interview with Katherine Young, translator of Farewell, Aylis: A Non-Traditional Novel in Three Works by Akram Aylisli, which has been banned in Azerbaijan. Since the publication of his novella “Stone Dreams,” author Akram Aylisli has been subjected to a harassment campaign and he remains under de facto house arrest in Azerbaijan. “On Author Akram Aylisli and Book Burning in Azerbaijan” features an interview with Katherine Young, translator of the banned book Farewell, Aylis: A Non-Traditional Novel in Three Works by Akram Aylisli. “There is plenty of debate in this country. But all too often, on social media at least, it is over what speech is appropriate and not over what is actually being said,” writes ABFE Director David Grogan. A new episode of Counterspeak, the monthly podcast from the American Booksellers for Free Expression, was released last week. 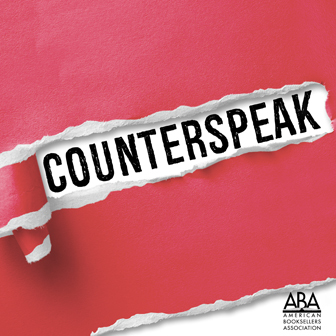 A new episode of Counterspeak, the monthly podcast of the American Booksellers for Free Expression, will be available for download on BookWeb, Spotify, and iTunes this Thursday, January 3. The first full episode of Counterspeak, a new monthly podcast from the American Booksellers for Free Expression, will be available for download this Thursday, December 6. Cindy Hulsey of Magic City Books dies at 58; Bookie's New and Used Books celebrates opening of second location; The Next Chapter Cafe to open in Northshire Bookstore's restaurant space; Empire Books to get new name; Second Star to the Right to move; The Learned Owl Bookshop celebrates 50th anniversary; Firestorm Books & Coffee files an appeal against the City of Asheville; and more.